Rye berry salad is packed with great flavor and nutrition yet low in calories. Roasted vegetables with crunchy scallions and arugula are accented with juicy pomegranate seeds and citrusy vinaigrette creating a fine main dish. Make this salad with any whole grain, including farro, barley, or wheat berries. 4 servings. Makes about 9 cups (2.13 liters volume) salad. * For 6 cups (1.4 liters) boiled rye berries, soak 2 cups (473 ml) volume raw rye berries (13.6 ounces or 386 g) in water with 2-inches (5-cm) water above allowing for expansion overnight. Drain. Boil in water for about 2 hours or until some berries burst open. 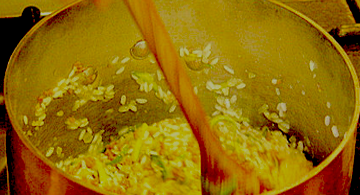 * For 6 cups (1.4 liters) boiled farro, soak 1 3/4 cups (414 ml volume) raw farro (12 ounces or 340 g) in water by 1-inch (2.5-cm) for an hour. Boil in water for 40 to 45 minutes. 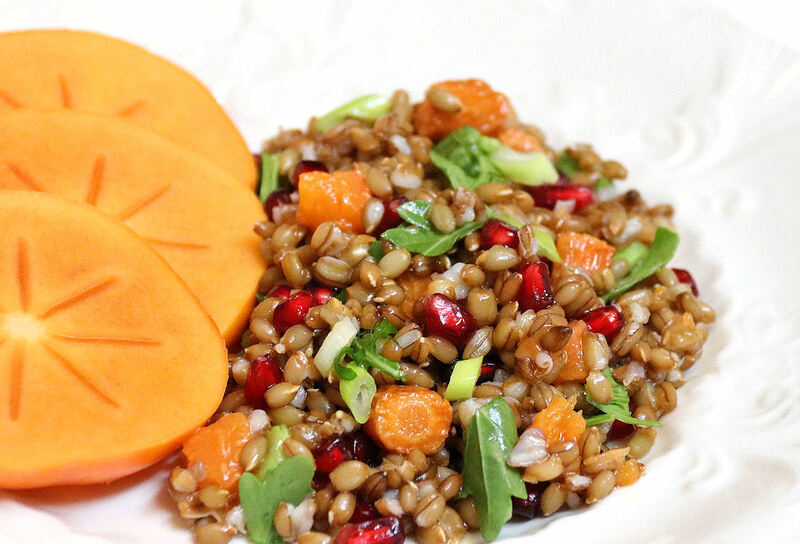 Combine the boiled rye berries, farro, or grains, roasted squash and carrots, pomegranate seeds, sliced scallion, and arugula. Season to taste with salt. Whisk together the juice and olive oil for the salad dressing until emulsified. Drizzle it over the surface of the salad, gently toss. Allow the salad to rest for 15 minutes for flavors to blend. Taste. Season with salt if needed. Optional: Sprinkle crumbled feta cheese over and toss. 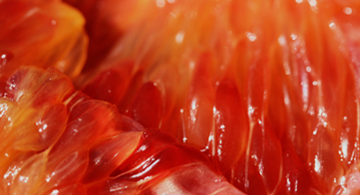 Slice fresh persimmon and place on the side of the salad, or cut into small pieces and toss into the salad.